It has been quite some time since Nebraska went into a fall camp with a true quarterback battle. To find the last true battle, you’d have to go back to the 2010 season when redshirt freshman Taylor Martinez was the surprise winner of the battle over Cody Green and Zac Lee. 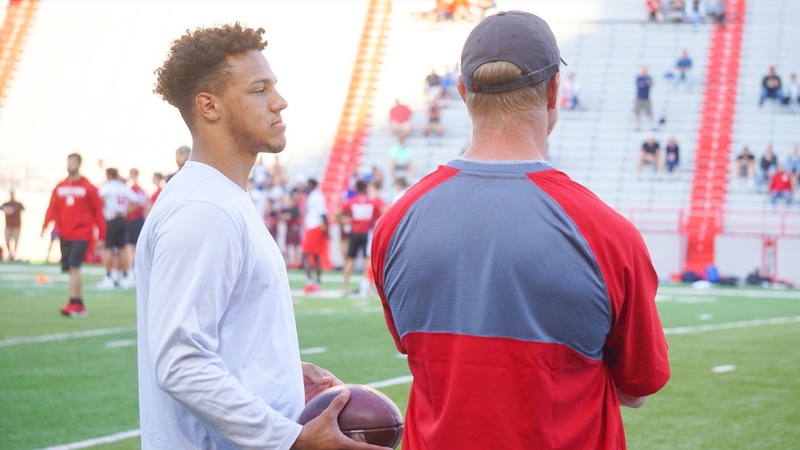 Heading into fall camp Friday, Nebraska will begin a battle that is seemingly close between true freshman Adrian Martinez and redshirt freshman Tristan Gebbia. Who wins the quarterback battle between Martinez and Gebbia will be the most talked about subject leading up to the first game with Akron. The decision to play a freshman quarterback or not is something coach Scott Frost has been through before. In fact, Frost had a competition between Justin Holman and McKenzie Milton at UCF in 2016. What happened during that battle and when the season started changed the course of Milton’s career. “We started my first season at UCF with Justin Holman who is a good player. We were going to redshirt McKenzie," Frost said about that battle at Big Ten Media Days in Chicago. "Physically, I just didn’t know if [Milton] was ready. He missed a little bit of fall camp with a hamstring that set him back even farther. "Whatever 'it' is at quarterback, McKenzie had it. He’s a playmaker. He’s got the moxie and confidence, cool under pressure. We knew he had all those things. We just wanted to make sure he was ready physically and knew the offense." And then Holman pulled his hamstring on the road against Michigan. Faced with a few weeks of recovery time, Frost made the decision to go with Milton. It was a season of mixed results for the freshman, but an overall good showing that prepped him for the future. While it's not yet clear who the quarterback will be for Nebraska in 2018, it's reasonable to expect that Year 1 in the Frost system will also produce some mixed results for either Martinez or Gebbia. In Milton's first season, he threw for 1,983 yards with 10 touchdowns. On the other hand, he had seven interceptions. Whoever gets selected this year for Nebraska will be inexperienced. However, both quarterbacks possess the intangibles that Frost and quarterbacks coach Mario Verduzco are looking for. There seems to a growing level of intrigue surrounding Martinez after his spring game performance. He had a good debut in Memorial Stadium with three touchdowns and close to 200 yards of total offense. Frost addressed Martinez’s growth throughout the spring in Chicago. Martinez may be the better runner over Gebbia, but that doesn't make him a lock to win the job this fall. Gebbia’s football IQ is off the charts and he continues to be one of the first guys in the building and one of the last out every day. He is also an accurate passer and quick decision-maker, two traits needed in this offense. According to Frost, the adaptability of the offense is what makes it special. He expanded on that notion when asked if former Oregon QB Jeremiah Masoli was the prototype for his system. “Jeremiah was a good player," Frost said. "He could really throw it. Was a really good physical runner. The great thing about the system is that it’s a different offense with him than Darren Thomas, [Marcus] Mariota, Vernon Adams than we ran with Mackenzie Milton. Frost’s prior experience with quarterback battles may not give us many hints about who he will choose. Instead, it tells us that his offense can adapt to the player that wins the job. It also provides reason to believe that quarterback selected will make a jump in Year 2.